As we all know that iPad 2 was released last year and since its launch it has been the best selling tablet and has been leading all the tablets markets worldwide for the whole year. After an year of its release, iPad 2 is still very successful product from Apple. iPad is available in both 3G connectivity and WiFi only models and basically tablet PCs are all about handy networking. So, as we know that there are millions of iPad users currently enjoying this handy device all around the world. We all are also aware of the internet freedom issues which are faced by people living in most of the countries. The problem is that the governments block some web content to follow their policies but that also prevents users to enjoy the freedom to full extent. There are many important websites which are banned and some are blocked in specific regions. People around the world are being affected with similar problems and they try to find ways to solve it. We have the best solution of all times; it is called Virtual Private Network or VPN. VPN is the private network which lets users to enjoy online freedom to full extent. VPN services mean that they provide you with their own IP address from another country instead of the one you are currently using from your ISP. This new IP address from another country lets you access all the banned content easily. For example, you might already know that popular streaming sites like Hulu and Netflix are only accessible in US but you can get the US IP address via VPN service and access these websites outside the US as well. In the recent times, smartphones and tablets are getting very popular and people usually surf web from their mobile devices. So, that’s why the need of VPN services on the mobile devices has also increased and people using internet from their WiFi hotspots or 3G networks also like to have freedom on the internet. iPad 2 just like I mentioned above is the best tablet around the world and most of the users primarily use it for internet surfing and other online stuff. So, we can say that iPad users also require VPN services. How To Setup iPad VPN? It is a very simple process in which we are going to configure iPad 2 VPN. 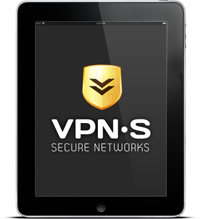 You have to follow, following easy steps to configure your Apple iPad VPN. 2) Select the Network option and the network settings will appear. 3) Inside the Network settings you will find the option of VPN, tap on it. 6) Tap Save and that’s it you have successfully configured your VPN connection. To help our readers who have got an iPad, we have made a list of companies that support iPad and can provide VPN Services for it. See the list below and let us know about your thoughts on the packages these companies are offering. 2 Responses to "Best VPN Service For iPad"